Tue, Aug 7, 2018, 07:30 pm SL Time, ColomboPage News Desk, Sri Lanka. Aug 07, Colombo: Sri Lanka's tourist arrivals rose 6 percent in July this year compared to the same period last year, the data released by the Sri Lanka Tourism Development Authority (SLTDA) showed. The month recorded 217,829 tourists arriving in the country compared to the 205,482 arrived in July 2017. As at 31st July, 1,382,476 tourists had visited Sri Lanka for this year. It is a 13.7 percent growth over last year when 1,215,926 tourists had visited the country during the same period. Europe continued to be the largest source of tourist traffic to Sri Lanka with 44% of the total traffic received in July 2018. 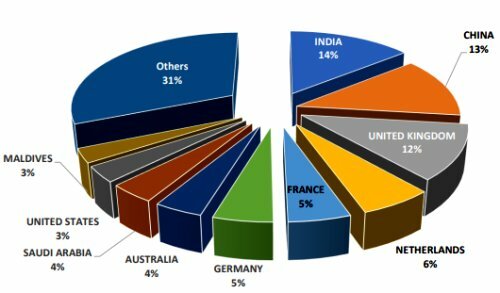 Asia and Pacific accounted for 42% of the total traffic, Middle East 7%, America 6% and Africa 0.5%. India, China, United Kingdom, Netherlands and France were Sri Lanka�s top five international tourist generating markets in the month of July this year. India was the largest source of tourist traffic to Sri Lanka with 14% of the total traffic received in July 2018. China accounted for 13% of the total traffic, while United Kingdom, Netherlands and France accounted for 12%, 6% and 5% respectively. Arrivals from North America rose 21.3 percent to 10,929 in July and the arrivals from US rose 47.5 percent to 7,164 during the month while arrivals from Canada remained same as last year. Tourist arrivals from Europe increased by 9.2 percent with the arrival of 88,375 tourists. Most of the tourists came from UK (25,208), followed by The Netherlands (13,342, France (11,303) and Germany (10,825). Tourist arrivals from Middle East marginally declined by 0.2 percent with the arrival of 14,517 visitors compared to the 14,543 arrived in July 2017. Tourist arrivals from Asia & Pacific increased slightly by 1.8 percent with 91,909 arriving in the island. Of those arrived from Asia, 31,032 were from India corresponding to an increase of 7.0 percent. Arrivals from Australia recorded 27.9 percent increase in arrivals with 8,801 visitors while arrivals from China declined by 3.5 percent with 27,460 visitors.